It’s no secret, Austin is located in the Texas Hill Country. The 3M Half Marathon course might have a -300 ft. drop in elevation from start to finish, but that doesn’t mean you should ignore hill workouts! Incorporating a weekly hill workout into any training plan will build stamina, strengthen your lower body, and increase your lung capacity. There are many Austin options for a great hill workout, but the four locations below are our favorite. If your favorite didn’t make our list, let us know on Facebook and Twitter. Wilke – Let’s kick this off with a well-known Austin classic in the Barton Hills neighborhood, Wilke. The entire road itself is about .3 miles, but you can push that to nearly half a mile (and >100 ft. elevation change) with this workout: begin at Barton Parkway and Wilke Dr. and run to the top of the Wilke, you’ll end at Rabb Road; turn around and head back down Wilke (make sure to control yourself! ); take a left on Barton Parkway; make a U-turn at the footbridge and return to your starting point. Rest for 60 seconds, repeat as desired. Ladera Norte – To visit Ladera Norte head to northwest Austin, past Far West Blvd. Many different routes can be created from this hill, but this workout is a ~1.3-mile lollipop route that has >330 ft. elevation change. Park at Ladera Norte and Valburn Dr. Head south on Ladera Norte and control your stride. Take a right on Backtrail Dr., it’ll end at Ladera Norte. Take a left on Ladera Norte and begin your ascent. Tip: keep your head low, lean forward, and keep your feet moving. Rest for 2:30 minutes, repeat as desired. The Hill of Life ascent. Hill of Life – Get off the roads and conquer the Hill of Life on the Greenbelt! Pay attention on this route, especially as you descend the Hill of Life. What starts at the top with great views ends nearly half a mile downhill, with nearly 300 ft. of elevation change. There are no turns to know, unless you want to run on the trail for a 5-minute recovery. Repeat as desired. Get to the Hill of Life on foot (several Greenbelt access points) or by car (take Scottish Woods Trial off 360). Pease Park – This double-roller near Shoal Creek doesn’t have the elevation gain of the other three on this list, but it’s a great workout nonetheless. Start near the picnic tables at Pease Park and run west on Kingsbury St. The climbs aren’t gnarly, but there is a flat part before the second hill. Use this section to briefly recover before attacking the second hill. It’s slightly more than a quarter mile before you turn around, use the downhill to recover. Recover at Pease Park for 60 seconds, repeat as desired. 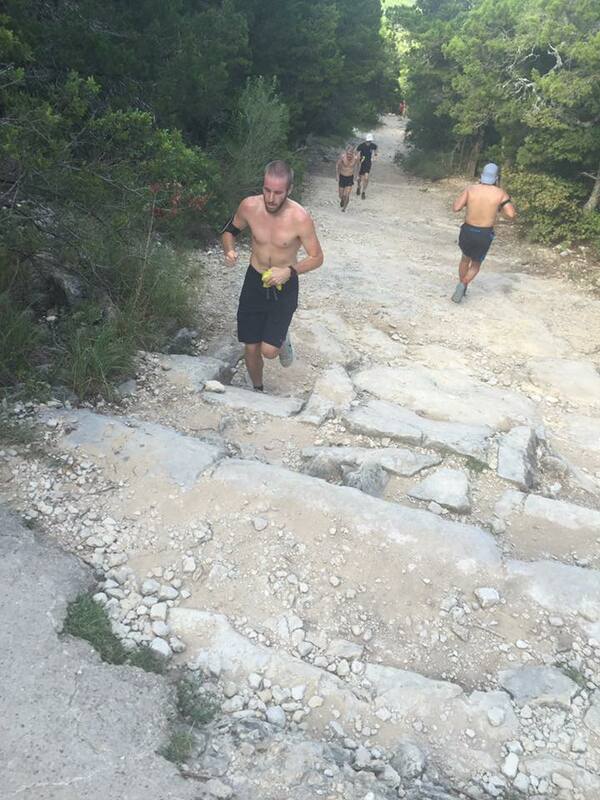 When you visit these hill workout locations it’s important to bring fluids with you, especially during the Texas summers. Pease Park has water fountains, but if you prefer your own hydration plan accordingly. As for all workouts on the road, be visible/reflective, run against traffic, be predictable and keep an eye out for cars. If you’re running as a group, don’t hog the road and run no more than side-by-side.